How to get a job: internship, graduate-role or create your own job in 2019! In 2018 I’ve run personal branding workshops for hundreds of students to help them land the jobs of their dreams. Students said that the sessions, “will definitely help me get a job!” Better than that, one student left and secured a job within the week, while another achieved his 6-month goal in less than 90 days, securing an internship & winning ‘Best Networker’ at his university. A student using LinkedIn, personal branding & networking strategies to achieve his 6-month goal in half the time! In this blog (with embedded videos, worksheets, screen-shares & guides) I want to show you exactly how you can get your dream job without sending a single resume, but instead using these personal branding tips & strategies. Instead, I want to show you how to create your own brand, how to market that brand & how to establish yourself as a serious player in your industry, rather than another double-sided, stapled-in-the-corner, A4-dead-tree in a pile. Here’s the 4-step plan… Are you ready to learn how to brand yourself for success? I’ve used LinkedIn to build Campus Consultancy from zero clients to more than 10 universities running our workshops & training days in 2018. Every single client has been inbound, meaning they’ve come through a recommendation, not from a cold email, but as the result of establishing brand. How to do that is what I want to teach you. WHY LINKEDIN IS THE SECRET SATAY SAUCE? Did you know that in Australia, approximately 10% of students are on LinkedIn? Did you know that only ~1% of LinkedIn users produce content weekly? He’s studying data analytics and has doubts that there is any point sharing his journey on LinkedIn. He says there are 150 students in his year-group. There are 2 year-groups at any one time. That’s 300 students at his university. There are approximately 15 universities in his city (Melbourne - rounding up). That’s 4500 students total. Who would you rather compete with, 4500 students, on paper, with no personality, in a stack of resumes OR with 4 students, where you can show your personality & your unique interests? Odds are that if recruiter found you, they might just hire all 4 of you! OK, so I’ve convinced him to take advantage of this opportunity, but where to start? HOW WILL THIS HELP ME GET A JOB? Here’s the plan & why reading this 4578 word post in FULL is essential. HOOK: If you’ve spent 4-years in a degree, doesn’t it make sense to spend 30-minutes learning how to land your dream job? 4. CREATE: Build & distribute different types of content to share your thoughts/ideas/expertise. This is a big step, and is the secret to standing out. Lean into this, even if it feels uncomfortable. And if you love it, a great supporting article by Forbes Magazine. The goal here is to look inwards, without judgement, and name attributes about ourselves that will shape our brand and be critical to Step 2 when we get there. When I was working in my first career pathway out of university, I was a civil engineer (exactly what I studied). I was good at engineering. I completed a graduate program in half the standard time & was awarded one of only a handful of 5/5 reviews, tied to my bonus. I was also well paid to be an engineer. At 22, I was earning more than my parents had for most of their adult lives, and I was raised without wanting for anything. The world definitely needs engineers. No doubt. It was my main motivation for becoming one, so I could help build houses/transport/services to help people live happy lives. The problem was, I did not love it. Look at the two overlapping circles, (i) Passion (ii) Mission. Was I passionate about engineering? No. Was this my mission AKA my ‘how’ to change the world? No. There are thousands and thousands of engineers graduating universities all over Australia every year, hundreds apply for single roles. Did they need me? No. I had achieved, but I wasn’t fulfilled, I didn’t have ikigai. How do you avoid waiting until you get to the top of the ladder before realising that you’re leaning against the wrong building? Time for you to make your best guess (because that’s all we can do at this stage) about what career path will help you find ikigai. Said other ways, what are you naturally good at? What have you worked hard to be good at? What do you do with ease that others struggle to do? What core human needs do you rank most highly? As DHH says on the Tim Ferriss podcast, values are things that reasonable people disagree on. Not “teamwork” & “honesty” & “transparency” – if you really believe that, are you sharing publicly the reason all your employees left this year? What do you believe is right? What are your governing principles for how you act in the world & make decisions? But Josh, this is all about looking inwards, how does it help me find my niche & identify where my dream job might be? A great resource for inspiration on this topic is Alan Watt’s What if money were no object (above). What projects would you get to work on? What skills would you develop? How would you describe the personalities of your colleagues? Fill in this PDF that can capture your personal brand at this point in time. Remember, this will change & should change, as you grow, mature & pivot your career. But if you don’t make the subconscious conscious, you will never be in the drivers seat. NOTE: If you want to start/grow your own business, write a made-up company name, e.g. <YOURNAME> Enterprises on the list. Can you pull 3-10-20 key words out of this exercise that you can own as components of your brand or as we will refer to them as, your branding word-bank? If you’re wondering what words to use and how to brand yourself online, these words will come in handy! WORD OF WARNING: I’m not a designer, I’m an engineer & an entrepreneur, so don’t take design advice from me if you want to win an Ramsay Art Prize, but do if you want to get fast, free results without the fuss. For the PERSONAL BRANDING KIT OF YOU there are 3 elements it’s important to get a deep & clear understanding of. Vision, is the next thing to identify. Where are you trying to end up? Note: Completely different people can have the same vision, and completely different ways of achieving that dream (mission) and we need that! Mission, is the final part. How do you want to get where there? WHO DO YOU WANT TO KNOW YOUR NAME? Remember how you identified 5-companies that you want to work for or do business with? Time to use those names! Firstly, I’ll show you how to follow key companies your dream job. These all have organisational power. What I want you to do here is simple. 1. Identify the companies/organizations you’d love to work for. 2. Type their names into LinkedIn. 3. Hit “Follow” on their page. Screen-share example of following a company, in this case KPMG. By doing this, you will see what the companies you want to work for are posting about, what they’re focussed on and what they value. Keep an eye out for the events they promote (attend them), the magazines/newsletters they promote (subscribe to them), the people they promote (follow them). In no time at all, you’ll be in synch, and synchronisation is the goal here. You don’t take better photos by following the most fire Instagram accounts. You don’t get your dream job by following the company you want to work for. BUT, it’s where we start. Just like on Instagram, if you follow an account that collates great photographers, you can learn a lot from these individuals. You can learn about lighting, about colour, about copywriting, about building brand and more. The same goes on LinkedIn. Companies are just made up of people. Without the people, they are literally nothing. Think about it. If everyone, EVERYONE, walked out of a company, would it exist? No. So if people make companies, now that you’ve followed the companies, it’s time to identify the people you can connect with to learn about the companies you want to work for. When you click on a company’s page, you can see a list of their employees. Remember, the goal here is to connect with individuals who are at a peer-level. So, if it is a big company that you want to work for, now that you can search for a specific job title within a specific company, perhaps within a specific region, you can click on their profiles and follow them. This is the easy option, but it has a benefit. When you follow someone, they get a notification. Not always, but a percentage of the people you follow will click on your profile (curious) and give you page a once over. If you’ve optimized your page then this is just as good as having someone inside your dream company give your resume a once over. Not bad. If you’re up for something more challenging, I’d recommend the cold invite. The cold invite: Sending a “Connect” request to someone who does not know you with a maximum of 300-characters of text. The secret to the cold invite is to ensure you make the 300-character invite polite, about-them and compelling. What’s an example of this? What if they don’t have any articles or recent posts? You can connect with something they did in their “Volunteer Experience” or their “Current Role,” but ensure it’s personal. Now, most people don’t feel immediately comfortable sending requests to connect with people they don’t know. Normally, from experience, this discomfort comes from fear of seeming impolite, disingenuous, inappropriate, unprofessional or imposing. If you follow the above guideline, you can avoid all five. The worst that can happen is that someone receives your invite, either doesn’t have time or isn’t a big LinkedIn users, and doesn’t respond. I’ve never once had a negative response from sending a cold invite but have had multiple job offers, new clients and even new friends as a result. Part-two of this goal is to arrange multiple coffees, phone-calls, meetings so that you can meet real people working on real projects with the company that you want to work for. Why? Wouldn’t it be better to find out now that the culture you thought you wanted to be a part of isn’t a fit with your values or that the job doesn’t really utilise your strengths? Alternatively, imagine how reassured you’d be to find out that you can be paid for your dream job or that what motivates you also motivates your new connection. When you do this, and arrange a number of these meetings, here are some great questions to ask, and remember, never ask for a job! If you want advice, ask for a job. If you want a job, ask for advice. · What does your average day look like? · How did you get your foot in the door? · What was surprising about your first few weeks/months on the job? · What parts of your job do you enjoy the most? · If you were me, what would you do now to be most prepared to step into a role like yours in the future? Now you’ve found the companies, you’ve identified some graduates or early-level employees, met with them, and learned a lot about what it takes to get in. You’re nearly at the point where you start putting yourself out there, but not yet. In the final step, STEP 4, you will learn how to create compelling content so that you stand out, but first, if you’re going to do that, you need to be in front of the decision makers! Now for the big one, find a win-win way to meet them in person. Recommend them to your university as someone who would make a great guest speaker at a scheduled event, or join a club/society and create an event that they’d be perfect for. Design it around them and be the person who brings them to campus. By putting them up on a pedestal, you help them promote their brand (win for them) and by you being the contact, you get to meet them (win for you). This is the long route, but proven again and again to work. The shorter, more bold route, is once again the cold invite but this is harder, as more important people are both busy, received more of these in the past (sometimes) and are less affected by flattery (sometimes). So you’ve met them, great, how does this help? These people have power due to their position and experience. If the project manager says you’re worth hiring, the recruitment team listens, even if they turned you down in the past. If the recruitment manager sees something special in you, they fast-track your application. If the program director thinks you’re smarter than the average bear, you get a pay rise before you start. All three of these things have happened to me, and they can happen for you too. If, and only if, they know who you are. CREATE: WHAT CONTENT SHOULD I MAKE? You’ve attracted a lot of eyeballs, so now it’s time to do your part. It’s time to put yourself, your thoughts, your work out there. A general rule: Don’t share anything you wouldn’t be comfortable with ending up on the front page of the paper for your Grandmother to read. The takeaway here is to share your journey, not come off as an expert, because, odds are, you’re not, and neither are very many of us. That’s it. It’s your job now to share all the amazing things you’re doing through these 4-elements. Here are 8-types of content to get you started. Example of “Educational” content posted on the Campus Consultancy page. Example of “Inspirational Content” posted by Neha Nagaraja. Objective: To give, without expectation. Example of “Giveaway Content” posted on the Campus Consultancy page. Objective: To get your audience to do something like buy, apply or share a link. Example of “Call To Action” posted on the Campus Consultancy page. Objective: To show your audience the work you’re putting in. 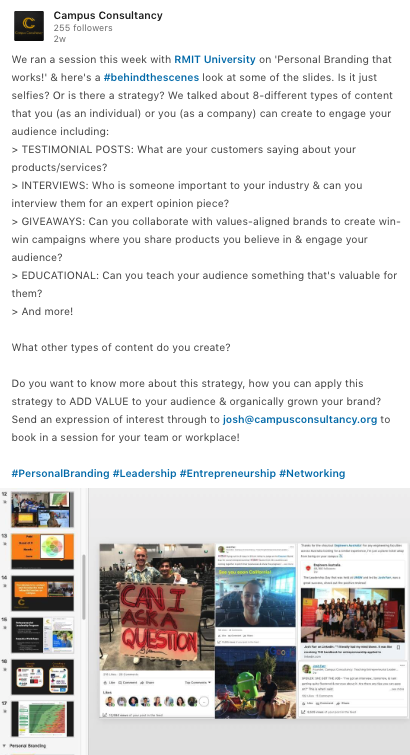 Example of “Behind The Scenes” content posted on the Campus Consultancy page. Objective: Show that you provide a great product/service/experience/event. Example of “Testimonial Content” posted on the Campus Consultancy page. Ideas: Think of people you want to know about you, and write ‘public fan-mail’ about them. It not only adds to your education (by synthesizing the knowledge, rewording it, and adding your thoughts) but also makes them feel appreciated & shares something that you value with your audience. Example of “Pedestal” content posted on the Campus Consultancy page. Ideas: If you were interested in entrepreneurship you might read industry news sites such as Inc. Magazine, StartupSmartCompany, Wired, Techcrunch. You might subscribe to topical newsletters such as LaunchVic, StartupVic (in Victoria) & share their points of view, tag the authors (after looking them up, following them) & position yourself as an eager learner about the industry. Objective: Make your audience laugh by pointing out a mistake you made, a discrepancy you’ve seen in human/animal behaviour or a quip can liven up your content plan. HOW DO I MAKE THIS CONTENT? Don’t overcomplicate it. Variety + Authenticity is the name of the game… and it works! Remember, the goal isn’t professionally filtered photos, it’s to share your story and add value to your audience by producing lots of different types of content to engage them. 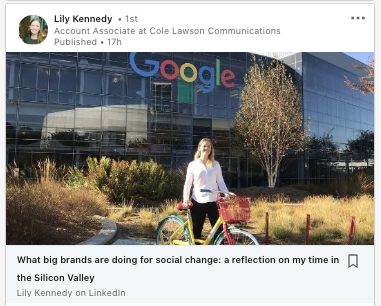 An article written & published by a student I had a phone call with about branding after her trip to San Jose as a young social entrepreneur. When you’re posting content, remember to tag using the “@” companies & individuals that are relevant to your post. Also, use relevant hashtags to your industry but be specific. Look at what hashtags the companies you’re interested in are using and use those too. Finally, whenever possible, encourage engagement with your post by asking a question that readers can engage with. Reply to each comment individually. Help your community feel that you appreciate their thoughts & the time they take to engage with your content. Instead of just saying “thanks,” make sure you use their name, try to make the comment personal & ask for more information from them. Ask for what specifically they liked about the post or message them & thank them for their comment. It’ll mean the world to them, because no one does this. That’s why it’s a whitespace, an opportunity for you to stand out. Mix up your posts using the different segments as a guide. Many companies make the mistake of putting out lots of “Buy Now” content and individuals make the mistake of putting out solely “Educational” or solely “Bragging” content. A well rounded brand needs a little of a lot, not a lot of a little. NOTE: You can be a complete beginner for this to apply. DO YOU WANT US TO RUN A PERSONAL BRANDING WORKSHOP FOR YOUR TEAM?